He is from Delhi but Himachali by lineage, which is the reason for his never ending love for Himachal. Professionally, he is a marketing specialist but a photographer by passion. He loves taking landscape pictures of places less or unexplored and also loves meeting new people. His videos captured through his DJI-Phantom-3 Pro are awesome and you must check them out for sure. People quiet often ask him about his favorite place, his answer to that is quite simple; it is at the top of any mountain🗻. He belongs to Kerala and loves to shoot mostly landscapes and nightscapes. His work has been featured in Nat Geo, BBC Earth and Space.com. He is also a contributor for BBC Earth. Currently living in Bangalore, this astrophotographer has also been featured on Huffington Post, Indian Express, India Today and Deccan Chronicle newspaper. He uses a Canon 6D and Sony A7s for normal imaging and Canon 1100D full spectrum moded for Deep space imaging. His latest light painting pictures are awesome and is inspired from Eric Pare. If you wish to visit Spiti, do check out his pictures from Spiti and we bet that you will start craving to visit Spiti asap. He is a Traveler, Explorer, Adventurer, Storyteller and a fresh Mountaineer. He belongs to Delhi and it has been quite a while that he has been travelling in Himachal Pradesh. He had been to Spiti, Kaza, Tattapni, Kasol, Kinnaur, Sangla, Shimla, Parvati Valley and Triund. He also went to Kedarkantha Peak in Uttarakhand. Recently, he brought her sister on her first ever trek in Himalayas. Even though he captured a lot of marvellous pictures during his visit in Himachal but his favorite one so far is not of some mountain or a valley but is of a small little girl from Grahan village whom he found very cute. He uses a Canon and a Nikon camera to capture most of his pictures and even his Oneplus phone does comes out to be handy for some pictures. Her instagram account is called “@rashnull” which I believe is just a way to write “rational” which means sensible or logical. She is a very passionate person and loves to travel and click some great pictures. Her photographs have been featured on many popular accounts of Himachal and Uttarakhand. She has a full time job but still finds time to escape into the mountains and click some awesome pictures. He is one of the most popular instagramer hailing from Uttarakhand. He is currently residing in Mcleodganj, a place known worldwide for being the location of exiled Tibetan govt. and as home for thousands of Tibetans. He is quite active on Twitter and Facebook and has a good following on both the platforms. His #alittlebitofnoor posts are one of the most interesting posts where he gives more meaning to the picture by sharing his thoughts and experiences. Only he can explain it in the best way but still you will relate to it on many levels. If you wish to travel with him then you can DM him on his insta account and presently he has collaborated with Spitiholidayadventure.com for a while and so you have a chance. This is how life looks like in the upper reaches of the Himalayas, where vegetation less surroundings welcome you and in between you find a party of mules ferrying the stuff over tall passes, while snowclad peaks continue to shine under a brilliant sunshine. . A scene during the journey over Pin Bhabha Pass, as I clicked this picture while standing on the pin valley side, with Bhabha pass in front of me, up those snow clad ranges that I crossed a day later. . One can also see the stormy weather developing on the other side of the pass, which is Bhabha valley in Kinnaur region. And one has to cross a 16,100 feet tall pass to reach there. He is a talented Adventure Photographer, mountaineer and UI/UX designer. He is settled in Noida but keeps travelling to mountains. 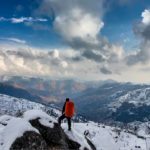 His pictures shows the best of Himachal, Uttarakhand, Leh-Ladakh, Meghalaya and Sikkim, etc. He is currently showcasing a technique called “Cinemagraph“, which is a combination of both picture and video. To be frank, I haven’t seen anything like that before and it is mind-blowing. He is really setting up the bar for amateur and professional photographers and we hope that Nitish will keep on sharing such awesome and mesmerizing photos and videos. Pure Pahadan at heart, Anshul likes to travel places which are blessed with beauty in terms of the landscape and the people living over there. She visited one of the most picturesque and serene places of Himachal to the World’s highest motorable road reaching Khardungla Top and she even visited far eastern states of our country. Not just her pictures will leave you amazed but the captions written by her are nowhere less than a beautiful poem or a deep story. Her pictures will help you in setting travel goals for Himachal Pradesh. Btw she is currently using Sony Alpha to shoot all these pictures below. A regular day starts with us paying respect to our Phones, and acknowledging notifications on Facebook from our thousand virtual friends. Post that hurried breakfast, there is a flurry of e-mails to take care of, traffic jams, incessant phone calls, power lunch, commitments and seemingly endless to-do lists which don’t leave us even a second to breathe. Pause. Now picture this. When was the last time you indulged in a long siesta without the pangs of guilt overcoming you? Have you walked in the park lately (minus gadgetry) taking in the greenery and watched the kids swing? Isn’t it a million years ago that you lingered with your coffee by your window in peace? Have you of late experienced happiness in doing nothing? Most of our answers would be an outright ‘No’. We haven’t. Instead we all want to read the newspaper while eating, connect on the phone while driving, and text or play I-pad games while spending time with our loved ones. The advancement of technology is making us find cleverer ways to multitask. As a society, our minds have been conditioned from childhood to constantly accomplish something every day and always be on the move. The success of our day is measured by what we achieve and not by what made us happy. Amidst the information-overload-filled life that I was leading, I recently came across The sweetness of doing nothing. Now please don’t confuse ‘doing nothing’ with laziness and take a moment to reflect why it is a way of life for the sensible Italians. The expression simply means slowing down, without hurling your mind in multiple directions, taking in the surroundings and just being. There is no rule book which says there has to be a purpose for every action of ours. In a society which respects us only if our appointment diaries are full, the thought of doing nothing, even briefly, seemed alien to me. We are invisible prisoners of our own thoughts. Idleness isn’t the demon which we make it out to be. Pleasant idleness minus the worry is a luxury we must all practise. Always having the desire to be on the move doesn’t allow us to be happy where we are and wants us to be somewhere else all the time. We hope that you really enjoyed knowing about these talented young photographers, travelers, mountaineers and yoga lovers. We might have missed some other such talented people but these are the ones whose pictures we often repost and their pictures receive maximum love from the audience. We hope they will continue their passion and love for photography and will help people to see more of Himachal Pradesh and other places too. We request our readers to follow each one of them on Instagram and appreciate their work as they help us set travel goals and even inspire us to be like them.